Researchers have made all manner of microfluidic machines, but have yet to come up with cheap, mass-producible biochips for handheld medical and environmental testing. A simple plastic chip puts the necessary pieces together. The seven-dollar device tests blood samples for the presence of E. coli bacteria. Scientists have caused a transistor to self-assemble from a test tube concoction of DNA, proteins, antibodies, carbon nanotubes and minuscule specks of silver and gold. The feat shows that it is possible to assemble the smallest of machines and electronic devices by harnessing some of nature's skill at building things molecule-by-molecule. Humans have many ways of expressing a given idea, but paraphrasing is a serious challenge for literal-minded computers. A system that learns by tracking news stories from several sources is able to paraphrase at the sentence level. The ability could go a long way toward making computers understand and produce natural-sounding language. Researchers have taken a shine lately to using the chaotic fluctuations of certain laser beams to encrypt messages. But no matter how tough an encryption code is, a message is only as secure as the method used to distribute the requisite decryption key. Chaotic lasers, however, could also hold the answer to the classic key distribution problem. Nanotubes detect nerve gas... Microneedles give painless shots... Layers promise cheap storage... Molecule makes two-step switch... Spin material handles heat... 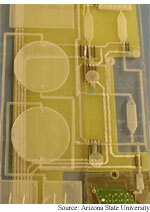 Carbon boosts plastic circuits.